Huntley Omuro, M. (2018). What now? An exploratory analysis of language maintenance on Japanese study abroad alumni. Studies in Self-Access Learning Journal, 9(1), 55-70. This paper examines the language maintenance strategies that naturally occur in Japanese university students who have returned from studying abroad. Often, immersion programs are seen as motivational tools and end goals for foreign language acquisition, thus this research seeks to find the answers to three questions: Do Japanese university students naturally develop maintenance strategies after studying abroad? If so, what are they and how can they be organized? Is there a connection between recency of studying abroad, duration, and the number of strategies developed? In this exploratory analysis, nine students were interviewed on their study abroad experiences, and the number and type of maintenance strategies they developed. A majority of students reported using digital tools and focusing on the input language skills, suggesting a preference or an availability of technological, passive foreign language tools. These findings provide a strong foundation for further, more expansive quantitative study. Throughout much of foreign language education in Japan, students are encouraged to study abroad, especially if they are in rural areas with little opportunity to interact with speakers of other languages. Studying abroad acts as effective motivation for acquiring a language while also providing an immersive environment that provides students with an expedited increase in communicative abilities (Coleman, 1997; Freed, 1998). However, this experience is often seen as the final step of students’ foreign language studies. Thus, when students return to their home countries, what should come next in their language education is not clear. Their time abroad has allowed them to surpass classmates and returning to the possible homogeneous environment of their classrooms may not offer chances for returning students to use and further develop their newly improved foreign language skills. A common source of motivation in ESL classrooms is studying abroad in English-speaking countries, where the deeply engaging surroundings naturally foster a spike in ability. Conversely, there is little research on the atrophy of language skills once students return to the environments of their own countries and the maintenance that is required to keep their foreign language skills at a functional level. While metropolitan areas may have more diverse populations that offer social opportunities for practice, rural communities often lack the international demographic that provide these interactions. Do students naturally seek out strategies of maintaining their foreign language in their home country after studying abroad? If so, what strategies do they use to maintain their foreign language? In the last century, much of the world has seen an increase in the need for multilingual citizens, so much so that many countries now have years of foreign language as a part of their compulsory education, often starting as early as elementary school. In Japan, the Ministry of Education, Culture, Sports, and Technology (MEXT) requires English as subject for a minimum of eight years, starting in the fifth year of elementary school. In addition, many universities have begun to require tertiary study as well. Teachers and students alike are aware of the limitations of studying a foreign language in one’s own country; for every hour spent in a classroom, exposed to a target language, many more are spent surrounded by a language the students have already mastered. Megumi Hirai’s article on the motivation of studying abroad shows that Japanese students believe the act of studying abroad to be an ideal solution for the shortcomings of foreign language classrooms (2014). Not only can the prospect of international travel be appealing and motivational, but it also provides valuable, real-world context and application for language learners. Giving students the opportunity to visualize themselves in concrete environments surrounded by the target language; the motivation to improve in that language is much more applicable than for learners who have no intention of functioning in the language outside of the classroom. Beyond mere motivational applications, however the immersion that studying abroad offers is one of the most effective methods of not only acquiring the target language, but also the understanding of the importance of communication (Hardison, 2014). In the studying of a foreign language, where there are few definitive measures of proficiency, studying abroad works as a very effective and concrete end-goal. For some who view it as the culmination of their studies, it is a valuable growing experience. For others, it is an effective source of internal motivation. Though the benefits of studying abroad and using one’s target language in an immersive environment are undeniable, there are unique challenges students face when returning to their home countries (Slobodova, 2013). Once students experience sharp increases in their foreign language capabilities, oftentimes their previous foreign language courses become remedial. The gap in ability between students who have studied abroad and their classmates with no firsthand experience can lead to not only social complications but also to an inability to find the requisite surroundings in which to practice and maintain acquired foreign language skills (Shimmi, 2016). Once a student’s study abroad program ends, if s/he is left without an environment with which to challenge their new abilities, then those skills, left unpracticed, will naturally begin to atrophy. Since being able to function in another language is often the primary goal for studying a foreign language, the prevention of language attrition must become a priority for a foreign language student. This is not as severe a problem in immersive environments as the constant interaction in the language itself acts as stimulation, (though specific parts of the language may deteriorate if neglected). Organizations that actively utilize people with foreign language skills, like the United States military, have begun to assemble language maintenance programs and incentives for soldiers who have taken the time to expand their linguistic arsenal (Bott, 1995). These organizations have identified that long-term investments of time and care are needed to keep these valuable foreign languages functional, particularly when the majority of the environment does not consist of the target language. Most of the time, this is self-initiated and executed out of pure internal motivation, as many workplaces do not offer opportunities for the development of this specific skill (Valmori, 2016). In academic settings, university students are often encouraged and rewarded for their efforts abroad through scholarships and credit hours, but the systems put into place for post-study abroad support focus on how to utilize the experiences in future careers and less on the retention of language and communication skills. With the internal motivation that studying abroad can inspire, combined with the learning strategies of their formal education and the survival strategies of being immersed in a foreign language, students have thus far been required to independently develop responsibility for language maintenance. Participants attending a rural university in western Japan were recruited in conjunction with the university’s international student services to volunteer their time in an opportunity to speak about their study abroad experiences. They were informed that their responses would be recorded and that anything they wished to be redacted would be removed from the study. Permission forms were deemed unnecessary as the participants gave verbal consent and the questions were not personal or intimate in nature. The sample pool consisted of nine Japanese students attending university full-time who had participated in university study abroad programs. Three participants were male and six were female, with an age range of 19-24 (M = 20.78). Five participants had studied abroad in English-speaking countries, two in South Korea, one in China, and one in Belarus. Time spent abroad ranged from three weeks to two and a half years and recency of homecoming ranged from one month to two years (Tables 1 and 2). Interviews began with demographic questions addressing age of the student and country of study. Answers were recorded simultaneously by the interviewer, a member of university staff who had no influence on students’ academic standing, focusing on the number and types of maintenance strategies reported. Interviews were conducted in English or Japanese, depending on student preference. Predictably, the five students whose target language was English requested English interviews, while the remaining four interviews were conducted in Japanese. Non-demographic questions were intentionally open-ended in order to avoid leading responses. Clarification questions were used for eliciting details concerning exact strategies, execution, and methods. Occasionally, open-ended suggestions of non-mainstream studies were indirectly offered (i.e. “How do you use social media to study your target language?”), as students were likely to categorize these activities as social or entertainment and without language-maintenance value. Interviews ranged from twenty to forty minutes and participants were given the option to be interviewed in English or Japanese, often resulting in a combination of the two. Once the interview responses were collected, the frequency of maintenance strategies was noted and divided into two different categories for the purpose of identifying patterns: language skills and medium. 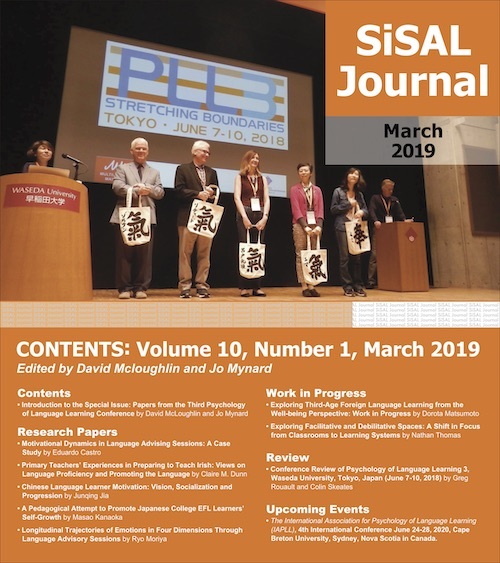 The four essential language skills —reading, writing, speaking, listening (SIL, 1999) —are often identified and accentuated in Japanese classrooms and it is thought that students may approach language maintenance in a similar manner. Additionally, the variety in the media of study materials emerged naturally as a method of organization. Media was divided into three categories; digital, paper, and interpersonal. Digital encompassed software and online resources; paper consisted of textbooks and physical materials, and interpersonal involved interactions with other people. Google Sheets, an online spreadsheet program, was used for identifying variables, coding qualitative data, calculating central tendency and correlations, and producing charts and graphs from data results. A descriptive statistics calculator was used for analyzing the demographic data (Herria, 2016). Sakura (pseudonym) is a fourth-year English Education major who lived abroad for one year between her second and third university years in a large city in Australia. Contrary to joining a study abroad program directly, she went on a working holiday visa with the intent purpose of enhancing her English ability in preparation for her future career. With her academic background in English and educational studies, she was very aware of the linguistic opportunity this provided her and was determined to make as many gains in communicative competence as she could. During her stay in Australia, she worked as an assistant in a Japanese classroom and soon found herself drawn to the institutional differences between the Japanese and Australian educational systems and the different expectations on teachers as a result. This interest led her to interact primarily with other young adults in the educational field, only a few of whom had Japanese language ability. Upon her return to the University of Shimane, Sakura decided that she would enroll in as many English courses as possible to maintain her English that she felt had grown exponentially during her year abroad. She was delighted to find that her comprehension of the native speaking professors was much stronger and reliable than her previous experiences, but struggled with finding level-appropriate peer conversation. Due to her linguistic strengths, she participated often in courses, but was frustrated with the lack of in-depth practice and review she had grown accustomed to in Australia. In the second half of her junior year and the beginning of her senior year, she found that graduation requirements were restricting her ability to pursue further English courses. Once her class load became primarily Japanese, she noticed a sharp decline in her listening and speaking abilities. To supplement this change in academic environment, Sakura sought out English media as a way to maintain skills she felt were waning. She renewed connections with friends and co-workers from Australia via various social media websites and applications. She also began to take advantage of university-provided materials such as English graded-readers, weekly newspapers, and the self-access language center where she engaged in weekly conversation practice, and ultimately endeavored to write her undergraduate thesis in English. When asked about opportunities outside of the campus, Sakura felt that there was little she could find. She would gladly assist the occasional English speakers at her part-time job, but the demographics of the rural Japanese area resulted in a very low occurrence of spontaneous interaction. While she sought out English media, her student budget limited her to the free national public broadcast television channels, which offer only a few programs in languages other than Japanese. Summarily, Sakura felt that English attrition was a natural result of returning to a country where it was not the primary language. While she was unhappy with the decline in her language ability, she was satisfied with the steps she had taken to increase the amount and variety of her language input. Ultimately, she would like to return to Australia, or go to the United States, as she sees English ability as a valuable life skill, and strongly feels that living abroad is the most effective way to continue language development. The total number of language maintenance strategies used by participants was calculated by differentiating the means of study. Using Facebook, for example, counted as one strategy regardless of how participants used it, and target-language classes were counted as one strategy, despite the number of classes participants were enrolled in. Textbooks and novels were counted as two strategies, as the nature of the study method was deemed separate, as well as the separate video techniques of watching movies and watching English-language channels on YouTube. Of the nine participants, all used at least one language maintenance strategy with the maximum number of strategies being eighteen (M = 9.63). First, participant strategies were divided into the four basic language skills. The input skills of listening and reading were the most prolific: thirty-three uses of listening techniques and thirty-two instances of reading strategies were reported. In the writing category, the reported number of uses was nineteen and speaking had the fewest reported at only nine occurrences. The total number of coded responses amongst the four skills was ninety-two. Overall, the most reported language maintenance strategy was listening to music in the target language. The thirty-three techniques of listening practice were spread over six categories with the most commonly reported being music and the lowest being tied between listening to CDs that accompanied language textbooks and Japanese language-learning television programs (Figure 1). Reading techniques were spread over eight categories, with the highest occurring being reading textbooks and posts on Facebook, and the lowest being reading novels (Figure 2). Figure 1. Reported Listening Maintenance Strategies. Of the nineteen writing strategies spread over six sub-categories, the most common technique was texting/e-mailing classmates, with the least reported being diary-keeping (Figure 3). The most reported speaking strategy was target language class enrollment and the least reported was talking with tourists using the target language (Figure 4). Strategies were also divided into the medium of the strategies: digital, physical, or interpersonal. Digital consisted of anything utilizing computer or smartphone software and applications as well as TV. Books and CDs were classified as physical, and interactions with people that did not occur through digital means were classified as interpersonal. Each medium was only counted once (i.e., posting and reading posts on Facebook, while accounting for two language skill techniques would only be classified as a single digital strategy). A total of sixty-five strategies were coded using this system of organization. Physical strategies had a total of sixteen occurrences, the most prolific being the use of textbooks (Figure 5). Sixteen uses of interpersonal strategies were reported, with the most reported being interacting with professors in the target language (Figure 6). Digital strategies were the most commonly reported with a total of nine separate techniques and thirty-three total occurrences. The most popular strategies were Facebook and YouTube, used by all but two participants (Figure 7). The descriptive data support the idea that Japanese university students develop their own language maintenance strategies after studying abroad with 100% of participants employing at least one technique of foreign language practice. Modal calculations show that the most common reported strategies are digital in medium and are focused on the input skills of listening and reading. The most prevalent of individual strategies were music, Facebook, foreign language classes, and YouTube. Possible relationships between study abroad time, recency to the program, and amount of strategies recorded were unable to be identified, as inferential statistics did not identify statistically significant results with this sampling. Based on these results, it is likely that study abroad alumni naturally, that is of their own initiative, seek out foreign language resources in an effort to maintain foreign language skills they have gained while studying abroad. This implies that students are both aware of foreign language progress they have made as well as the possibility of the decline of their foreign language abilities in their home countries. Students overwhelmingly utilized the input skill-based strategies of reading and listening. At this point in the research, it is difficult to suggest if this is due to an unequal amount of resources dedicated to these skills over speaking and writing or if it is a reflection of the Japanese education system and its focus on input methods in the foreign language classroom (Butler & Iino, 2005). Similarly, it is difficult to say if the reasoning behind the large number of digital strategies is due to the familiarity between students and technological applications for higher education (Bulman & Fairlie, 2016), the wide range of digital strategies available, or the low monetary threshold that digital services such as social media and YouTube video hosting offer when compared to the cost of physical study materials. Although valuable information about the presence of language maintenance strategies was identified, there were some unavoidable limitations. Due to time and budget constraints, this research was conducted on only a small percentage of the population of Japanese study abroad alumni. Additionally, the logistics of the interview structure further restricted the students who could be surveyed to those who were physically on campus and able to attend a half-hour session. The voluntary nature of the population resulted in a rather large spread of experiences in study abroad target language, length abroad, and recency in returning to Japan. This diverse sample pool led to equally diverse results, making it difficult to accurately identify specific patterns in strategy construction and use. In order to generalize results for larger groups and reveal more specific interactions between study abroad alumni and language maintenance strategies, an increase in participants as well as a narrowing of the type and recency of study abroad program should be carefully considered. As this is an exploratory look at language maintenance strategies after studying abroad, the size of this sample makes it difficult for this data to be considered statistically significant as well as to be reliably applied to a larger population. However, despite the wide range of experiences in participants, the presence of maintenance strategies in all participants shows the need for further, more expansive research on a larger sample size. Once a more complete demographic profile of post-study-abroad language maintenance strategies has been constructed, the next logical step is to focus on the strategies themselves and determine the effectiveness of the various types of foreign language maintenance. With more data and a clearer picture of what students need once they have returned from their study abroad programs, universities will be able to take steps to provide the support and systems needed to maximize foreign language acquisition in students who have studied abroad. Melissa Huntley Omuro is conducting master’s research at Southeast Missouri State University and is an adjunct faculty member and supervisor of the self-access language lab at the Hamada Campus of the University of Shimane. Bott, D. W. (1995). Maintaining language proficiency. Military Intelligence Professional Bulletin 21(4), 12-20. Valmori, L., De Costa, P. I. (2016). How do foreign language teachers maintain their Proficiency? A grounded theory investigation. System: An International Journal of Educational Technology and Applied Linguistics 57, 98-108. What changes did you notice in your [target language] ability while studying abroad? Since returning to Japan, what changes have you noticed in your [target language] ability? In what other ways do you use [target language]?